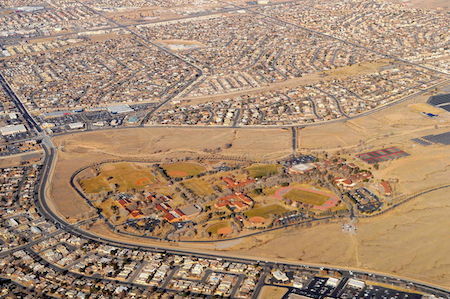 Albuquerque Academy opened its doors in the fall of 1955 with 12 boys in grades 7 through 9, two teachers, and founding head William B.S. Wilburn. Classes were held in rented space in the parish hall of St. Michael and All Angels Church. In 1957, enrollment had grown to 75 boys and the school moved to a 27-acre site on north Edith Boulevard. The first class of seven boys graduated in 1960. In 1966, the Academy moved to its present location, and in 1967-68 was home to 405 boys. Girls were admitted in grades 9-12 in 1973. Celebrating its 50th anniversary in 2005, Albuquerque Academy today serves over 1,100 young women and men in grades 6 through 12. The Academy’s remarkable growth was made possible largely through the transformational gift of Albert G. Simms, a New Mexico financier and rancher, and his wife, Ruth Hanna McCormick Simms. 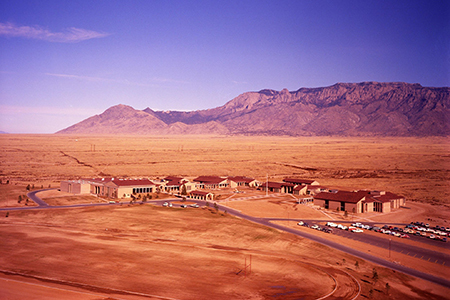 In the early 1960s, Mr. and Mrs. Simms gave or bequeathed to the Academy (in trust) more than 12,000 acres of undeveloped land and 7,500 shares of Albuquerque National Bank (now Bank of America) stock. This gift, now supplemented by the philanthropy of generous and grateful recipients of the Simms legacy, enables the Academy to provide students with the highest quality education in a beautiful and uplifting environment. The uniqueness of the Academy is due, in large part, to its commitment to a need-blind admission policy. Only after students have been chosen are their tuition needs assessed. A financial assistance budget of over $4.3 million provides approximately twenty-seven percent of Academy students with need-based assistance. Further, every Academy student benefits from the school’s commitment to accessibility and affordability as endowment spending of close to $5,700 annually per student subsidizes tuition to support excellence and breadth throughout the Academy program and facilities.